I have owned ‘Little Joe’ our 1964 Splitscreen camper for over 4 years now. I have had some great times and feel I would never part with him (yes! It is a him not a her, I know he has eye-lids but still!). Many brides and grooms who use Canny Campers for weddings really want a camper to own. 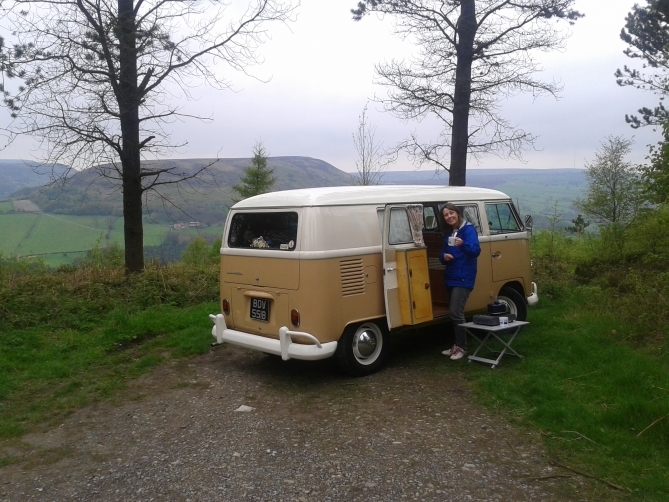 I therefore thought I would list my personal good and bad points of owning a classic camper. I am not going into repairs and bodywork really. That depends on the state of the camper that you buy. These are simply my thoughts based on my time with ‘Little Joe’. 1) Camping on tap – If I don’t have a wedding, my camper can be stripped of wedding interior in no time. Underneath the white interior is my orange camping interior and I am off like a shot to any campsite I can. Ok when I say like a shot, I mean 50 mph! 2) It looks super cool – I am a show off by no means, and hope not to become one, however you do get a warm feeling when your little van gets a wave from every generation from small children to pensioners. This is also true of all the VW Campers from T2 – T5, they all look cool. 3) On your bike – I don’t have a bike rack on my camper but I can fit a bike in the back, off to Hamsterley Forest, on the bike for a bit and back for a cuppa in the van or even a picnic. 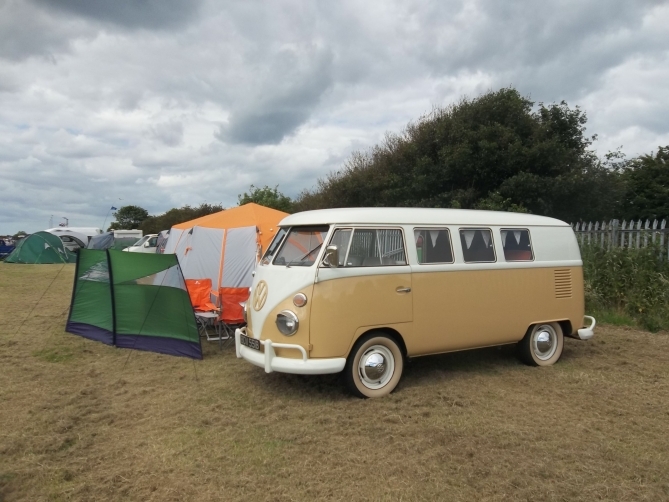 4) It is an asset – Unlike a modern campervan these classic campers tend to hold value better and if looked after can also increase in value. It’s not cost free motoring but it is a positive of owning a classic camper. 5) Hotel on wheels – I don’t know how much money I have saved by using my camper instead of booking into hotels but it can be measured by the gradual curvature of the spine I have from not being able to stand up in the thing. 6) Festivals – This is my favourite thing by far and should really be number 1. When you buy a vw camper you also buy into an amazing scene. 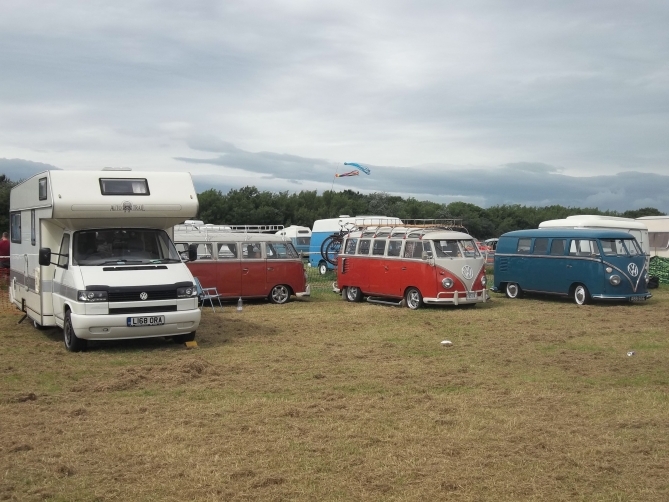 Local and National VW Festivals are held mainly during the summer months. They offer a unique experience in my opinion as you get all the fun of a festival, bands, booze etc but you can also take the kids, take the dog (if you have one, I don’t and our cat won’t come). Best of all you go back to your camper and have a little bit more comfort and facilities than a small festival tent. Don’t worry about even taking tiny babies with you either. I have seen many a child at a festival asleep in those little retro red trucks you pull around. You can also take your friends and not fail to have an amazing time unless they hate that sort of thing! 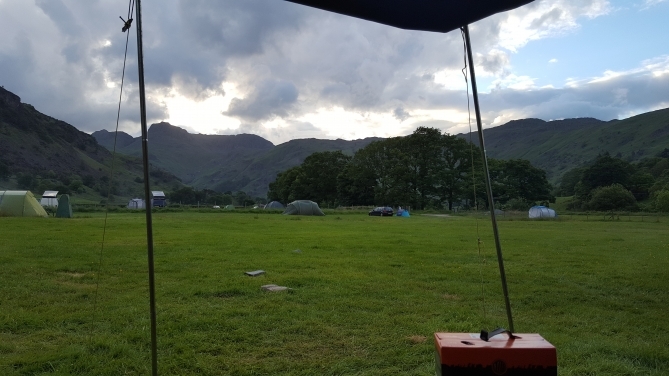 7) A toy with all the trimmings – I once heard that you could fill a field with VW Campers and no 2 would be exactly the same and this is certainly my experience. 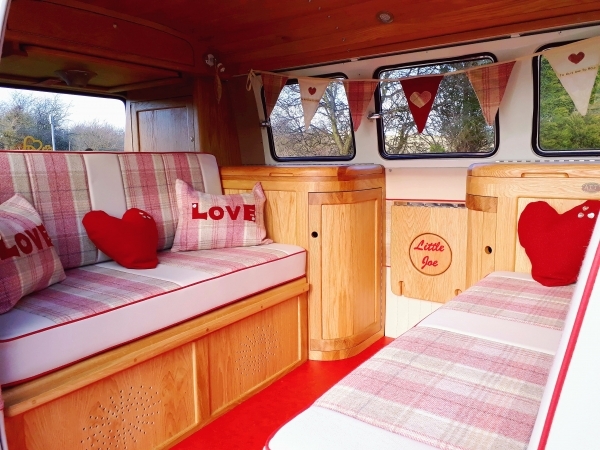 You and your partner can personalise the camper to suit your tastes and needs and best of all there are so many companies out there who can provide nearly every part you need, customisation you want and interior conversions and so on. I recommend involving your partner with this side of things, it has meant ‘Little Joe’ is our camper not just mine and I have been amazed at how good Julie is at fixing things and making things for ‘Little Joe’ I have learnt a lot! 8) Common Interest – Owning a campervan and/or beetle makes it all the more fun finding out what other VDub owners do with theirs. Camper and Bus Magazine and Volksworld Magazine are a fantastic read as they cover all sorts of Dubs not just shiny show winners. Loads of interesting facts are included, pictures and everything to get the general VDubber hot under the collar. 9) A drive in the country – Driving a classic VW is different to driving a modern car but I love taking the beetle or camper out for a drive in the countryside, listening to the unique gurgle of the low powered engine in the back! It might be low powered but they have enough torque, also with no power steering you feel like you are driving as well, rather than the car doing all the work. It just makes the journey part of the experience and can add a bit of spark to a trip out. 10) Historical Vehicle – 1 benefit I love about the camper is it is Tax Free, due to its age. There is no better feeling than getting a free 12 months tax disc (trust meJ)! The Insurance is good as well if unlike me you don’t do weddings. Not only is the free tax, cheap insurance a plus point but also knowing you are keeping a bit of history going. Each VW will have its own story I have found a few old American coins in mine and a 9mm bullet! So who knows what sort of thing my bus has been involved in? It is certainly no getaway vehicle! I know you new Husbands might have read the first 10 points with your now Wife and thought a camper is on its way, the argument is won. But in the interest of democracy here are my bad points. 1) Presents – Every single present you will get if you have a VW Camper will be VW Camper related. It’s not a problem for the first 20 gifts but where do you keep that 100th VW mug and on what wall do you hand that 22nd VW Clock or Canvas. God bless eBay! 2) Mortgage or Camper – Its one or the other in my case, unless you have more money than you know what to do with. You can either buy a camper that needs work and spend thousands getting it where you want it, or buy a fully restored example and pay thousands for it. I think the only way to do it on the cheap (to an extent) is if you are really handy with mechanics, welding and such like. 3) Garage It – I have 2 garages, 1 for each VDub. You could buy a cover for them I suppose but I used to do that and mine blew away, once a week! If you don’t keep you VW dry it will rust. Unlike a modern car, classic campers don’t have the rust proofing and the British weather does them no good. Keep it covered. 4) Mechanics – Everyone seems to think VW Campers are easy to work on and anyone can do it, simple mechanics. This, I have found to be a load of rubbish. If you don’t know what you are doing and have no intention of learning, or in my case need to make sure the mechanics are tip top for weddings, use someone that does know. I really mean who does know. Make sure they have been recommended to you by everyone you know and trust, or find out the hard way. Even if they say they are VW Specialists just check out feedback from others and the web. Your camper shouldn’t brake down all of the time they are reliable (touch wood! ), if they are looked after correctly. 5) The Journey – Due to the age of these vehicles I can almost guarantee you will go on some emotional journey. It is very rare that everything is perfect when you buy the vehicle and you will go through ups and downs. Keep going though, you will get through it and not only have an amazing Dub but also a new member of the family. 6) The size – Tin Top Splitscreen Campers offer a clever use of space but if you require more space and possibly more functionality there are a couple of options. You could buy a Bay window T2, T3 Or Newer these campers are bigger and many have pop up roofs with a bed in them or just extra standing height. The Bay window camper and newer are also more likely to have more facilities such as 230v electric hook ups and such like, but many splits do have these as well. What I do for extra space is add a massive drive away awning on the side. It’s so big the camper could actually park in it. 7) The Speed – My camper has a single port standard 1600cc engine and is fairly low powered maybe 40-50HP (not sure exactly). It is fine around the doors due to a thing called reduction hubs that lower the gearing and give the camper better power up hills and round the doors. The issue with reduction hubs is they limit top end speed a bit but I can do 55 – 60mph without too much trouble. There is a solution if this is an issue. You could install a bigger engine and taking out the reduction hubs to do an IRS (Independent Rear Suspension) conversion. This requires a different gear box as well from a later VW, but is a good time to lower your bus as well. 8) Driving experience – My camper has many standard parts and set up, this means for me it’s a different type of drive to a newer vehicle. The speed is slower, the braking is fine but not as sharp as a new car (not that it matters when you are going 45mph everywhere!) and the gears are a bit sloppy as it the steering. It takes a bit of getting used to but it’s actually a really nice drive when you have adjusted your thinking. Again, if these things are an issue they all have modern solutions that can be fitted to your Dub. E.g. modern disk brakes, modern steering rack (I think even power steering may now be available), Bigger Engine and a better gear shifter. I may do a couple of these in the future myself but not power steering as I think that will spoil things a bit. 9) No good in a hurry! – People love these vehicles and no matter where you go they attract attention. I can never just put petrol in without the young lad at the garage talking to me for half an hour about the camper (I don’t mind though, if your reading this J), but I have had to ask for a copy of his shift pattern and I now go at midnight with a false beard and a petrol canister. 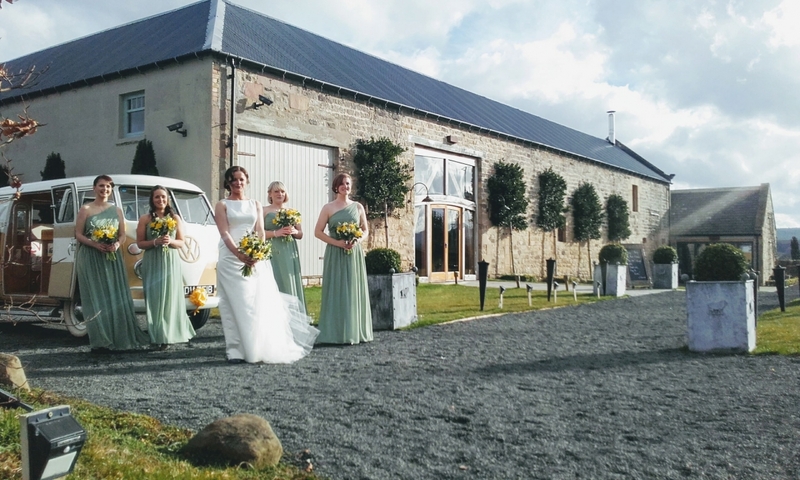 10) Rome wasn’t built in a day – I have spent endless amounts on making sure ‘Little Joe’ is restored and of a quality to provide fantastic wedding transport and giving me my camper on the side. It is too easy however to get caught up in making the camper better and better, which is fine but make sure you enjoy the thing as well. If you are just interested in perfecting a classic vehicle, it may not be the best one to choose. The VW Camper is about the lifestyle and not just the metal work, paint and mechanics. 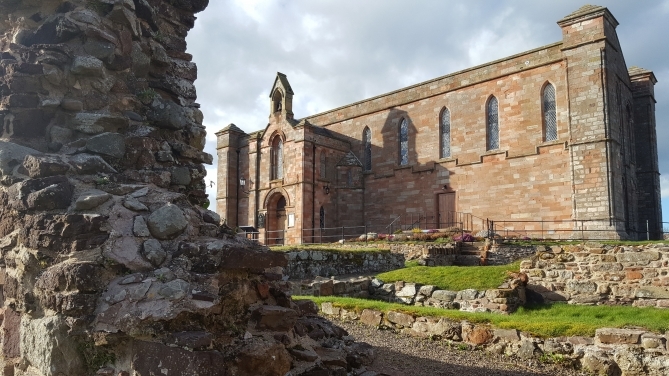 I hope this article is of some use to you, as I mentioned I have tried not to be really technical as I frankly would get wrong for not knowing what I was talking about! I have therefore written this based on my experience as a generalist. 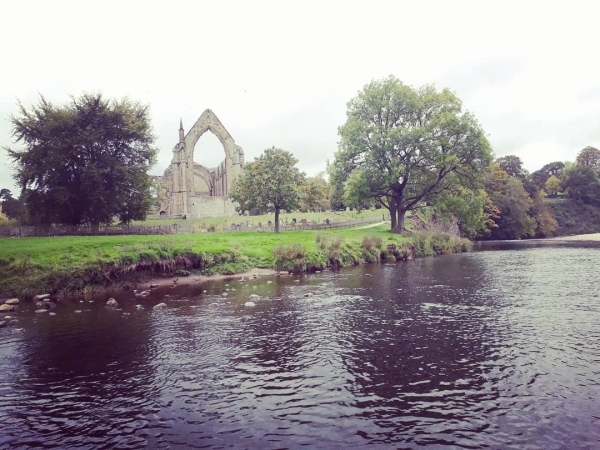 Hope you enjoyed reading my first (non-pinched) blog!